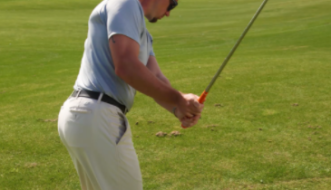 First, I want to explain why you’re hitting behind the golf ball, what you need to do to correct it, and then how you can practice it with a couple simple feedback drills. In terms of hitting behind the ball, let’s first define what we want to do, and then we’ll talk about the things you can do to stop that from happening, and I’ll give you some drills to do. Now, I’m going to pull a simple alignment rod. Now, we’re on a mat here, on which an alignment rod here will work fine. If you’re on the grass, you can spray-paint a line or just have a line as a reference. A piece of tape or something like that would work fine. I’m going to put this alignment rod straight in line with the golf ball on the ground. (Watch the video to see what I mean.) So, the point is, when we’re hitting too far behind the ball, that compromises our contact, compression, and distance that the golf ball goes. We want to fix that. If I were to take a normal setup here, if we watch good golfers, their club will come down, will strike the ball first, and hit the ground second. So, if I remove this golf ball, and that’s the line where it normally is on, what we want to be able to train to do is have the club head hit in front of the line where our golf ball would be. That’s the first piece of this. So, when someone would come in to train this in person, if we have solidness of contact issues, I will put a line on the ground, we’ll set up as if the golf ball’s right on it, and we’ll start with little short swings, just chip length, and get you getting that club head to hit the ground in front of it. Watch the video to see the rest!